Last fall, the St. Romanos Byzantine Choir of Beirut did a concert tour of the eastern part of the United States, from Chicago to New York. (I’m still enough of a Northwesterner to think of Chicago as “eastern”.) I had really hoped to be able to go to one of the stops, but the only real possibilities were Chicago and Cleveland, and the dates just weren’t friendly to either option. Hopefully, the next they come to the States, the St. John of Damascus Society can help bring them to Indianapolis (I can’t imagine Bloomington being a reasonable possibility without resorting to putting them in a straight-up concert hall, which would sound great, but it really wouldn’t feel right). 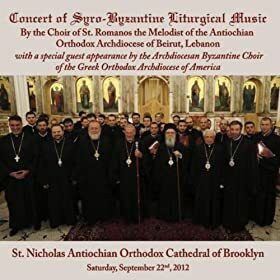 A live recording of the final stop on the tour at St. Nicholas Cathedral (Antiochian) in Brooklyn has been released as a two-disc set; this particular concert also happened to feature the GOA Archdiocesan Byzantine Choir, both as a featured choir and with the two groups singing some combined and antiphonal things. The program represents a nice sample of the Byzantine repertoire throughout the liturgical year, largely in Arabic, and in a variety of textures; the Megalynarion for Pascha, the Kontakion for Annunciation, and the Katavasiae for Theophany, for example. The Greek choir does a lovely handful of things such as “A Good Word” with kratema, and “Before Thy Cross” with Dynamis, and then the combined choir sings a short program including hymns like the Varys Great Prokeimenon and an alternating Greek/Arabic Great Doxology. The musical ability on display here is top-shelf indeed; St. Romanos is a great choir made up of first class singers. There is the characteristic strength of individual voices that one finds with good Byzantine choirs, but there is also a blend, a unity to the sound achieved by strong direction and solidity of musicianship throughout the ensemble, that one only hears with exceptional choirs, regardless of repertoire or geography. They achieve this in faster, syllabic textures, such as the Theophany Katavasiae, as well as in slower, melismatic textures, like the Holy Saturday Doxastikon of the Praises “The Great Moses”. Production values are quite high; the recording is very clean with minimal background noise (always a potential problem), and the presentation of the CD itself is very handsome and professional. 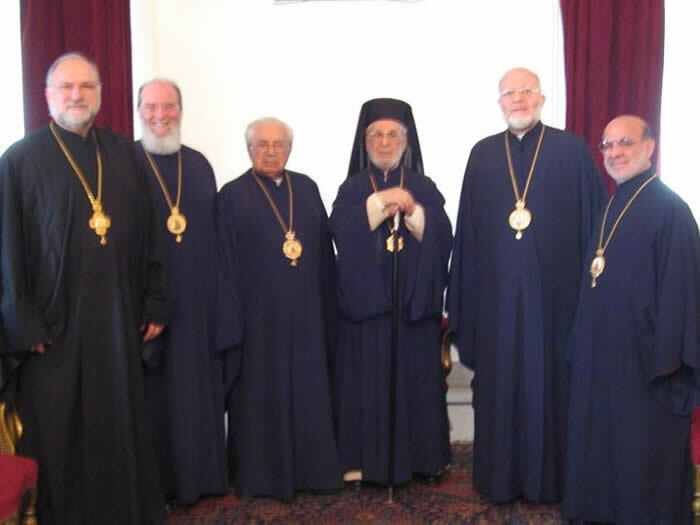 The whole package represents a nice step forward for this kind of product, and I hope that this is not merely a one-off but the first of multiple such efforts out of the Antiochian Archdiocese. I’m only just in the last year or so starting to get to know Arabic as a liturgical language (entirely passively thus far, to be sure), and this recording (as well as Sam Cohlmia’s Dormition CD that came out last year) is helping my ear start to become accustomed to it. 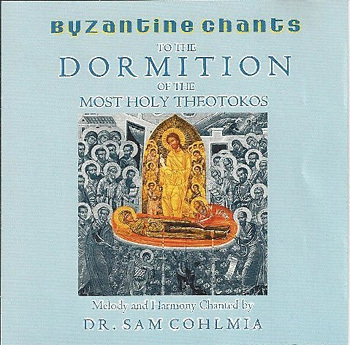 Both Dr. Cohlmia and the St. Romanos Choir give a moving account of the liturgical use of Arabic; when sung well — as on this CD — the language comes to life beautifully in Byzantine chant. The music is identifiably the same “language”, as it were, but in a different “dialect”. The style adapts itself to the language when both are given proper attention, it seems to me. I am certainly not one to argue that one should “have” to learn Greek or Arabic or Russian or Finnish or Romanian to be Orthodox; not at all. However, I would say that to me, these represent wonderful opportunities to learn a language in a particular context, as well as to get to know an additional (not necessarily better, don’t misunderstand) dimension of the faith. None of these are “God’s language”, as such, of course (any more than, say, King James-style English is), but each perhaps has something to teach about how we worship God. In the world of classical voice, languages have different things to teach us about singing; it seems to me the same could be true of worship. Overall, this recording is a lovely document of what seems to have been an amazing event to have participated in; I wish even more than I did that I could have been there, and I am left hoping that it happens again soon. Recommended.